best site purchase Clomiphene online canada Well, we’ve done Spring and Summer tours ….. this is the end of the prep for the start of our Fall tour. We hope to have a European journal for each season before we finish our travels through this world. You might ask “end of the prep”, what does that mean? In our case … a lot. It started with the basic question – can Gerda go and what will she need? Her type of cancer requires daily treatment (chemo pills) so can we take it with us? and what happens if there’s a relapse? Well, the good news from her doctor was … yes we can go. The bad news was … there’s no guarentee of no relapse so bring painkillers (opiods) in case. Simply put, our decision was she’s living with cancer …. so let’s live by going! This may be our last trip or it maybe the start of many trips; regardless, we will make the most of our time together. So how to start …. 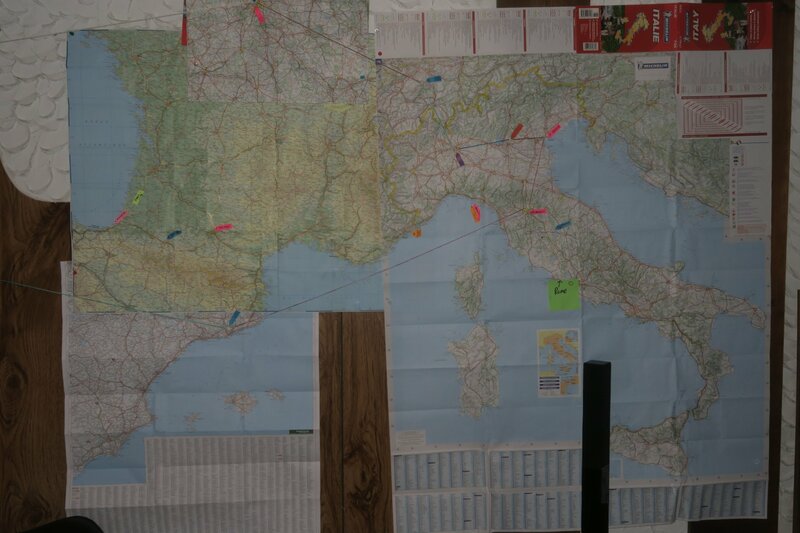 well a map or in this case many maps, stitched together – France, Spain, Italy and Switzerland. 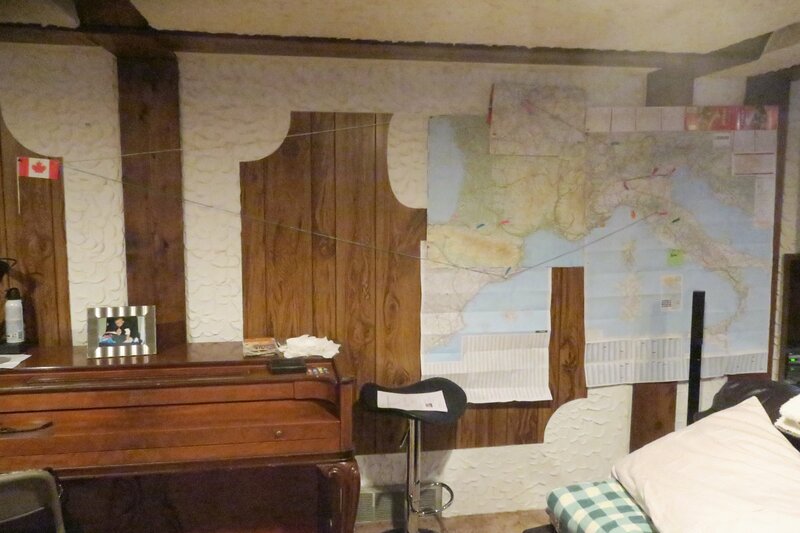 We don’t need Canada or the Atlantic Ocean, but we decided to show the connection, hence the flag on the wall to the left of the maps. Pins on the map to represent our wish list. And, of course a string to tie it altogether. After much discussion, we initially decided on Barcelona, Milan, Verona, Venice, Florence and Paris. Below shows a closeup map of the final result. After many iterations, where we had actually booked all the original hotels, we decided the final leg Florence – Paris was too long. Our original plan was to fly from Barcelona to Milan then go by train to Verona, Venice, Florence and then Paris in that order making the final leg over 8 hours. If we go from Milan to Paris we shave it by 3 hours. So …. decision time – we changed our itinerary, our schedule and rebooked our hotels. Barcelona to Florence then go by train to Venice, Verona, Milan and then Paris. Ohhh … 5 hours is still too long ….. well maybe a stop between, say somewhere in the Alps. Lucerne sounded the best of all the ‘in-betweens’ …. Lucerne it is! Ironically changing the schedule opened up a new opportunity – seems we will be in Venice during the International Film Festival. Gerda hopes to see George Clooney, she even offered to babysit! Forever the optimist. After all that, the only thing left to do was arrange the flights and our activities in each location. Enter the intrepid Connie, our travel agent from CAA. She helped arrange all the final detail with efficiency and patience (plus a tinge of humor for Brian). Thanks Connie, we really appreciate your dedication and help. Tragedy struck Barcelona, August 17th, in the form of a terrorist attack – 14 dead and over 100 injured. Fanatical, radicalized cowards attacked crowds along the Las Ramblas …… literally outside the hotel we will be staying at. Decision time again …… not really! Brian sent a note to the hotel to ensure they would be open and let them know our condolences and solidarity for Barcelona and the victims. They replied 10 minutes later to say they were delighted we are coming and appreciated our support. Game on …. We still be will going …… So join us our our next journey. Life is fragile with or without illness, we intend to embrace what we have to the fullest and never look back.